In trying to get attention for work, a colleague is concerned with the ‘learning’ label being a potential detriment. It’s probably true, and that’s a sad state of affairs. While I joke that we who work in the learning/training/performance/etc field are those who’ve retained their love of learning despite schooling, I do believe that there’s some baggage associated with the term. If you put on a ‘serious business’ perspective, learning can seem like warm and fuzzy coddling. “What we really need is to hire the talent we need and let them know what to do and have them do it, right? They’ll do it, and like it, or they’re out!” Which, of course, is ridiculous, but who doesn’t believe that view is out there? What’s really the case is that each organization will have it’s own way of doing things, and that individuals will need to be brought up to speed, then provided resources to support performing, and expected to contribute. And, as I am coming to believe, as things get more complex, we’ll need more from people in terms of adaptation. Today success is in the hands of creative people who have energy and excitement over reaching a business objective. These people are hard to find and hard to keep as their energy and entrepreneurial spirit are not always suited to a controlled environment. They need space, time, and freedom to experiment. They thrive in a networked world where they can exchange ideas, swap experiments, and engage in conversation. That, to me, is learning. To look at it another way, I lump innovation, problem-solving, creativity, design, and more all as activities of learning. Herb Simon said “to design is human”, and I believe that design is about learning. But maybe it’s about thinking? Doing? So, to me, it’s a shame that a ‘learning’ label would be a barrier to being perceived as relevant to business, but that seems to be the case. My question is, do we rebrand, or do we reengineer learning’s status in the organization. I don’t have an answer, do you? Why is the world getting more complex? Certainly, we’re getting more information, and technology is increasing the rate at which we can sense, and respond (reducing product cycle times, for instance, as someone can replicate what you’ve developed very quickly). There’s a lot more pressure, as a consequence. But is it something fundamental? I was pondering Dave Snowden’s Cynefin framework (wonderful 4 minute video explaining it), particularly the chaotic domain and it’s prescription (roughly “do something, and hope to move it to one of the other quadrants”). It’s kind of a deep concept, but basically there are: simple topics where there’s one right answer (which we ought to automate, in my opinion); complicated issues, where we need expertise; complex issues, which we can only explain in retrospect but can adapt in, and the chaotic space. It’s the latter that concerns me, it seems to be a case of “abandon hope, all ye who enter here”. Ok, seriously, it’s a place where the approach has to be much more experimental. I reckon it’s a place that most managers and even executives want to ignore. And yet, I believe that the world is going more and more in that direction. In fact, I’m beginning to believe we’re at a inflection point where we suddenly need to realize that ‘management’ just won’t cut it. Sure, for legacy industries, for a while. But why? Why is this fundamentally different? I think that things moved slow moved enough that while they really were chaotic, the general patterns were good enough most of the time. But things have increasingly gotten faster, accelerating, to the point where those seemingly random shifts are happening so fast that they undermine staid process. It’s not the information overload, and I began thinking that it is, instead, how quickly ideas can take hold. It’s not things that are the dominant factor here, it’s people. People’s reactions to marketing campaigns, messages, etc are largely unpredictable, and the likelihood and consequences of something going ‘awry’ are increased. The so-called ‘viral’ message is increasingly a disruptive factor. And why is that? If new ideas that are powerful can take hold quickly with minimal friction, their disruptive influence is magnified. Rightly or wrongly, a fun or powerful idea can catch fire and be a game-changer. If there’s the possibility for almost instantaneous spread, we’re truly past the point of no return in terms of chaos. Which brings me to Twitter. Even the latest web page had to be emailed and there wasn’t a quick way to get the message around in a broadcast style except if the mainstream media picked it up, or you had an established network. Spreading beyond your network was difficult. Enter Twitter. For the first time, a viral meme can spread almost instantaneously, reaching critical mass in the amount of time required for a few retweets. It’s a network of one to many, and 140 chars is about perfect for ‘meme’ length. It’s just a twitch to pass a message on. I’m not saying Twitter itself is the force of change, I’m saying it’s emblematic of the change. If someone’s thought captures a new thought, or plays with an existing idea in an intriguing new way, it can spread almost instantaneously. Much more so than before. That’s a power that can be used for good or bad. Companies should be mindful that a misstep can reach many really quickly (time to get on the ClueTrain!). And breaking news can spread before the media reach the masses (cf flight 1549 landing in the Hudson). On last week’s #lrnchat, which I missed most of for my lad’s band concert, I tuned in during a break and saw that Marcia Conner (@marciamarcia) had asked a question I wanted to answer (but couldn’t in 140 chars :). She asked: “Would someone explain diff between sims (often used well for ed) and VWs?” She was concerned that some people were using them interchangeably, and I do think it’s important to have some clear definitions. A simulation is, technically, just a model. It’s captures the relationships of some part of the world (real or virtual), typically not all. It can be in any potential state, and be manipulated to any other valid state. When we put that simulation into an initial state, and ask someone to take it to a particular goal state, I want to call that a scenario. And, typically, we wrap a story around it. We can tune that scenario into a game. Not turn it, tune it. A game is a scenario that’s been optimized to have just the right (subjective) level of challenge, a story learners care about, and a bunch of other elements that characterize an engaging experience. So what’s a Virtual World? In the above definition, it’s a simulation with the particular characteristics that it’s 3D, and typically also can host many individuals within it. Now, the infamous World of Warcraft has been turned into a game by a) embedding a bunch of quests (initial states where you try to achieve certain goal states) and b) tuning the experience to be compelling (even addictive). It gets interesting when we start talking about learning in the context of sims, games, and Virtual Worlds. A simulation, for a motivated and effective self-learner, is a powerful learning environment. They can explore the relationships to their desired level of understanding. The only problem is that motivated and effective self-learners are unfortunately rare. So, we more typically create scenarios. When you choose an initial state, and properly choose the goal state, you can ensure that they can’t achieve the goal state until they fully have grasped the nuances of the relationships and can act upon them in specific ways. That’s the essence of serious game design! This is, I argue, the best learning practice next to live performance with mentoring. The benefits to scenarios, of course, are that live performance can have costly consequences (e.g. losing money, breaking things, or killing people) and individual mentoring doesn’t scale well. Are there reasons to tune a scenario into a game? I want to argue that there are. First of all, there are the motivational aspects, keeping the learner’s interests. Second, optimizing the challenge means that the learner is moving through in the minimal amount of time. Finally, we can alter the storyline to make it more meaningful – exaggerating characters or motives or context – which actually brings the practice environment closer to the urgency likely to be felt in the real world, when it matters. Truly, learning can and should be ‘hard fun’! How about learning in virtual worlds? I’ve talked about this before, but certainly, I believe, if the learning objectives inherently support 3D reasoning, whether industrial plant arrangement and operation, molecular structure, or architecture, absolutely. However, a virtual world is just a simulation, and if you want learning outcomes, you need either self-directed and motivated learners, or embedded scenarios. Which is what I have been seeing, for example I have seen a very nice demonstration for insurance adjusting. On the other hand, virtual worlds currently have some overhead issues: learning to be effective in them has a learning curve, and there are technical overheads as well. Consequently, I have been loath to recommend them for many situations where they could be used, if there isn’t an inherently 3D rationale. However, I do believe that a) the overheads are rapidly being dropped by advancements both UI and technical and b) that there are some ephemeral things that are still fully to be realized. People I trust, including Joe Miller and Claudia L’Amoreaux of Linden Labs, Karl Kapp of Bloomsburg University, and Tony O’Driscoll of Duke University, continue to express not only the available, but also the untapped potential. Still, I think the definitions are solid, and am comfortable with the current assessment of virtual worlds. I’m willing to be wrong, on the latter :). I welcome your thoughts. I’m still reeling from the intellectual stimulation of the Corporate Learning Trends Conversations on Learning in Organizations that was held a few days ago. One other big learning for me, in addition to the responsibility of learners, was the issue of corporate learning culture. There were two facets to this. The first facet has to do with the characteristics of a culture that is conducive to collaboration and communication. From a business point of view, it’s about execution and innovation. Execution works in well-defined domains, but innovation requires a variety of factors that characterize a learning organization, including feeling safe to contribute, tolerance for different ideas, and more. Increasingly, I believe, organizations that can innovate fastest will be those that thrive, so successful organizations will be learning organizations. One of the participants mentioned organizations where you can’t share mistakes, and that’s emblematic of organizations that hire smart, aggressive people and expect them to go out and succeed. Which leads to some smart choices, but also you see repeats of the same mistakes. You don’t really see the effects of that culture until you put in social media, where it becomes obvious whether people are contributing, sharing, etc. And that was the point I made: to address culture, you have to be explicit about it, it can’t just be background. An organization should choose it’s culture, with a recognition of where it is now. You’ve got to be realistic, or you won’t be able to sell it, which may include being honest about how it has to change. But if you don’t talk about it, make it explicit, support change, reward changet, etc, it can’t happen. It may not be easy, but it should be done. The second facet has to do with cross-cultural issues. In the session, Allison Anderson of Intel and Dave Wilkins of Mzinga and I discussed the challenges of trying to cross borders and cultures. I pointed to Hofstede’s cultural dimensions via a web tour, in making a point about how different cultures can have values that are contrary to a sharing culture. I cited an example where a company in a country with a low gender difference (MAS) value had acquired a company from a country with a high gender difference value. The potential problem is that a male engineer from the high gender difference country might not listen to a female engineer from the low difference country, yet this would not be in the company’s best interest. There are clearly problems in expecting someone to adopt a company culture different than their national culture, and yet there is clearly some advantage. I idealistically suggest it’s worth the effort, if you buttress it with vision and mission, discusison about organizational success, and provide support for the transition. Like with responsibility for learning, corporate vision & mission, and accepted ethical standards, organizational cultural values needs to be discussed explicitly: defined, modeled, scaffolded, and even evaluated and rewarded. If it’s not explicit, it’s not fair to assume. This is really about taking responsibility for organizational learning at a larger level, architecting it, and leveraging technology as an infrastructure that supports the architecture. 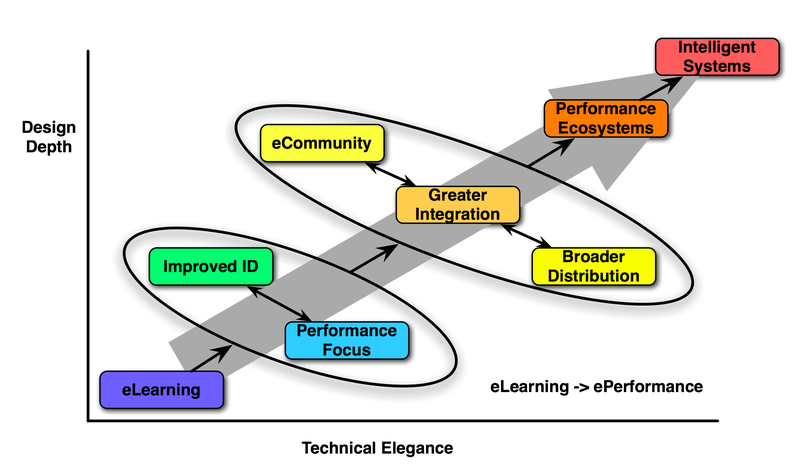 It’s meta-learning, and that’s the paradigm I think organizations need to not just survive, but thrive. On the fantastic Corporate Learning Trends online conference Conversations on Learning in Organizations, one of the topics that came up was “How can we get learners to take resonsibility for their learning”, and it’s a critical one. At the end of the day, we can’t create learning, we can only (at best) design environments that are conducive to learning. Learners have to actually take action. Now, in most instances they’re willing (though our current formal learning is often antithetical to ease of learning; e.g. “spray and pray”, “show up and throw-up” sessions), but when we go beyond the formal course (and we should), we largely abandon learners to their own devices. That’s a mistake, as the empirical evidence is that efficacious self-learners are relatively rare. They get by, but they’re far from optimal. For instance, the first online courses had high dropout rates and relatively low success until they started facilitating the learning process. Similarly, the work literacy movement is specifically to address the need for these skills. And it’s not only about skills, but also attitude. When I was teaching at a university, I was always dismayed at the number of students who’s attitude was “just tell me what I need to do to get a good grade”, without caring about the inherent interest in the subject. Sure, our current schooling may well extinguish the love of learning, and so may the ‘industrial’ approach to training. However, an intrinsic interest in learning is critical to success, individually, organizationally, and societally. However, organizationally don’t talk about learning, about learning skills, and we don’t take responsibility for developing those learning skills and making them meaningful. So my first response was, and is, we need to be explicit about learning skills: about their existence, importance. And we need to do more, we need to measure them, model them, develop them, and reward them. As many have noted over the past 24 hours of the conference, the role of the organizational learning function is shifting to facilitating learning, not delivering it. While there’s still a role for formal learning, our pedagogies and our responsibilities need to shift to learning facilitation, both formal and informal. Learners need to be assisted in taking responsibility for their learning, and we need to take responsibility for making it so. In the end, organizations that learn best, will be the ones that survive, and thrive! So be responsible, and support responsibility! This starts out slightly technical, but eventually gets to the learning! My first job out of college was designing and programming educational computer games (FaceMaker & Spellicopter may be the two best known titles). When I went back to grad school, I went for the design side, though I’ve kept the ability to understand what technology does, and do a bit more than the average bear. So when my internet connection started getting flaky, I realized I had a problem. Not the basic problem, but because there were several comonents in the chain, and it’s hard to isolate one without substitute parts. And, of course, when you have two potential culprits, it’s so typical to have the manufacturer of one blame the other, and vice versa! Now, my DSL modem and my wireless router were both quite old, at least 4 years and maybe as old as 6 or more. And I didn’t have a spare of either router or modem. What was I to do? For those who are curious, the DSL signal comes in on the phone line, and then the modem translates it into ethernet. That could go straight into the computer, but instead I have that go to a wireless router to serve all the devices in the house (currently 4 computers, a Wii, two DS’s, and my iPhone; when no one’s visiting!). The phenomenom I was seeing was the connection starting to hang on various accesses. Rebooting both router and modem solved the problem (rebooting only one never seemed to work), but only for a while (8-24 hours). BTW, this behavior was described both by the ATT guy and a guy at Fry’s as classic hardware going bad. I called ATT, and they agreed to send me a new modem (I reupped for a year). That came and I managed to get it installed. Took several tries, since they forgot to tell me that the modem now stores it’s own account login details, so those detalis don’t need to be stored in the router! Ahem. That one bit of info, and I was up and running again. For a while. Then the flakiness happened again. So off I went to Fry’s for a router. For a ridiculously low price they had a refurbished one available, so I nabbed it. Same brand, only a newer version of my old one, which I was happy with. Taking that home, I finally accessed it’s settings, but couldn’t make it talk to the modem! The lights on both modem and router said they were connected, but no traffic would go through. And I couldn’t access the settings via wireless, and it took a long time for the settings page (you control the router through a web page it hosts internally). I took the router back and exchanged it. I was willing to bet that the first one was just flaky. With the new one, the settings page came up almost instantly, and I could access it wirelessly as well. OK, that seemed better.And the lights indicated everything was fine. But, no traffic was still going through!?!? I was pretty sure that, it being the weekend, I couldn’t get help ’til Monday, but I searched the Netgear site anyways, and they said they had phone help 24 hours, so I called and got through. The guy there first said he couldn’t help me by phone for a refurbished modem, but then proceeded to tell me just what the problem was (turns out he couldn’t walk me through online, but could give me the details, which was all I needed). Of all crazy things, the modem and the new router both want the same URL! He had me reset the router’s IP address to something different, and viola’, I’m online! The learning here is severalfold. First, systematicity helps. Now, I know that, but it’s nice to have a chance to practice it. One of things I miss most about not programming anymore, besides the ability to create new experiences, is debugging. I loved using logic to try and figure out what’s wrong, and testing, repairing, and so on. I used to work on cars with my Dad, and the same process would be followed. I think systematic research and testing is a meta-learning skill, and one we really don’t teach in school, yet it’s critical! Another meta-learning skill, or really attitude, is persistence. I didn’t have an option, because no internet connection would be a critical business issue. Fortunately I had a connection, it was just flaky (and with all this online seminar action coming up!. And I admit there were times when I was tempted to use bad language (or did), and/or had to take time out to cool off. But I kept thinking, testing, talking, reading, and more. Of course, the two critical pieces of information would’ve been devastating if I didn’t have them. And I didn’t find either in a discussion forum, I talked to people, live. I’ve learned to be very clear about the steps I’ve already taken, and that helps to short-circuit what can often be very basic stuff (e.g. “did you plug it in, and are the lights lit”). I mentioned that I’d tried the manual, and my steps, which helps build credibility with the tech person (the router person commented that he thought I could do with just the instructions). So, I think we could and should spend more time developing reasoning skills as well as rote knowledge (duh! ), and help people learn to share their thinking to help identify the problems faced. And now, here’s hoping it was the hardware and not a different problem! Note that this ate up a lot of my time this past week, what with store, and time on tech support, etc, so this is also an apology for my lack of blogging this past week! We’re about ready to kick up a fair bit of dust! TogetherLearn (Jane, Harold, Jay & I, in various combinations) are serendipitously going to be sending out the social learning and strategy message in a number of ways. First, on the 21st of April starting at 9AM PT but revolving around the globe for the subsequent 24 hours, Corporate Learning Trends will be hosting a day long circle-the-globe Conversation about Learning in Organizations. Jay is the organizer, and he’s arranged a host of the biggest names in organizational learning to take part. Still needed are hosts and topics in regions around the world for blocks of time. This is free, but we do expect participation. So seize the day, pitch in, and make it happen (or don’t complain when there’s nothing happening in your preferred time slot). On the 22nd, Harold, Jay, & I are going to be part of the ASTD Pulse of the Profession series of webcasts, talking about Blowing Up the Training Department: Make Learning a Management Priority. Registration is $39.95, but it supports ASTD (we don’t get a dime), and we’ve got a good session planned, with the esteemed Kevin Wheeler serving as our ringmaster/lion tamer. It’s specifically intended for managers, directors, & executives charged with part or all of organizational learning. We intend to talk about the problems that organizations are facing, some of the barriers, and some new ways to think about it. Then I will be presenting on April 30 (10 AM PT) for Training Magazine Network’s Provocative Ideas webinars, speaking about Why Incrementalism Won’t Cut It Anymore. This presentation is free, but you have to register. I’ll be looking at the bigger picture, not just social/informal, but also content strategy, mobile, and more, and particularly focused on systemic changes and the need to shift, not creep. I’m sure there’s more I’m forgetting, but that’s enough for now. Hope to see you here and there! I finally ‘graduated’ from TwitterFox (a plugin for Firefox, and a great way to start Twittering) to TweetDeck, an AIR application. It’s more sophisticated, but then it’s another application I’m running in parallel (what with iChat, Adium, and Skype all running, and now TweetDeck, Mail, and Firefox, before I’m working in any apps, I’ve got a lot of RAM and CPU cycles being sucked up. However, I went to TweetChat, a website that provides an interface just for such chats, because it only follows your hashtag, and automatically puts it in your tweets. That worked well. However, what my colleague Sky (Jim Schuyler) noticed was that all those tweets were flooding the twitterverse. In fact, he found out about #lrnchat by a sudden flurry of tweets from some people he knew, including me and Marcia Conner (why he hadn’t seen the earlier tweets about it is a curiosity :). That’s the downside: that all those tweets go out to your followers, who may not know what’s going on. Harold Jarche also opined that maybe Twitter wasn’t the right tool for chatting. It’s an interesting issue, but it’s really all about tradeoffs. For example, Meebo is more dedicated to chat, but there’s more overhead to get hooked up (it connects all IM channels, but you’d have to be on IM). If you’re on twitter, you saw the message and could participate. However, I admit I felt bad if anyone who watches my tweets felt inundated (let me know; valuable feedback). I previously found it the situation that if you have new channels, new people can find ways to express themselves. I think chat has some great affordances, as you don’t have to take turns, there can be parallel conversations going, and it doesn’t take a lot of bandwidth. You couldn’t do it in video or audio. There might’ve been times I wanted to draw a picture (as I did in a small TogetherLearn chat with Harold and Jay the other day). Still, a potentially powerful channel (as I find when serving as a backchannel for a presentation). Interestingly, the amount of activity on Twitter with #lrnchat suddenly peaking triggered some automatic signification that #lrnchat was a trend, and we got some auto-pings to fill out a definition of what #lrnchat was at What The Hashtag! Which of course brought in some people looking for ‘action’ and to flog their personal issues. Even in the discussion, the mention of Yammer brought in the Yammer team mentioning some of their case studies, which got a bit annoying. The risks of popularity, I guess. Another issue, besides tool, was whether 2 hours were too much. While we expect some to have to drop out, or drop in late, is it useful or valuable to go that long, or would shorter be better? However, I really liked the chat format. As Marcia reminded us, when it gets fast, there may be too much to follow, but that you should just take the value you found. There were some sparkling gems in the conversation, and valuable information. It was very worthwhile. While it may be only one channel, it certainly seems a valuable one for some (maybe those, like me, who read and/or type fast). The topics ranged from organizational barriers to Twitter (hence the mention of Yammer as a solution maybe more appropriate for a company with more than a few people, as it has some knowledge management capabilities as well), to the value (or not) of Twitter. We covered case studies (and the lack thereof), the nature of the necessary culture, the role of informal learning in the organization, and more. Apparently some were able to view the archive and catch up quickly, so it’s not only a ‘you had to be there’, though I don’t know if it’s easily accessible post-hoc (going back now to both TweetChat and WTHashtag weren’t particularly useful just now). Overall, I think the notion of having a regularly scheduled chat on learning is very valuable. What mechanisms are the right ones, is, to me, still an open question. So there you go: what do you think? So I’ve been playing with rethinking my Performance Ecosystem conceptualization and visualization. The original had very discrete components, and an almost linear path, and that doesn’t quite convey the reality of how things are tied together. I believe it’s useful to help people see the components, but it doesn’t capture the goal of an integrated system. I’ve been wrestling with my diagramming application (OmniGraffle) to rethink it. My notion is that systems, e.g. content/knowledge management/learning management systems underpin the learnscape, and that on top exist formal learning, performance support like job aids organized into portals, and social media. 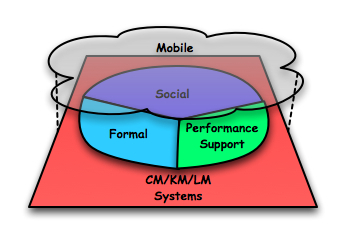 Mobile is a layer that floats on top, making contextually accessible the capabilities assembled below. It’s not perfect, but it’s an evolving concept (perpetual beta, right/). So here’s my current conception. It took me a long time to create the circle with different components! First I had to discover that there were tools to create freeform shapes, and then work to get them to articulate, but I like the kind of ‘rough’ feel of it (appropriate for it’s stage). It also captures the conceptual relationships as spatial relationships (my principle for diagram creation). At least for me. So here’s the question: does it make sense for you? Does it help you perceive what I’m talking about, or is it too a) coarse, b) confusing, or c) some other problem? I welcome your feedback! On Monday, a hearty Twitter exchange emerged when Jane Bozarth quoted Roger Schank “Why do we assume that theories of things must be taught to practitioners of those things?” I stood up for theory, Cammy Bean and Dave Ferguson chimed in and next thing you know, we’re having a lively discussion in 140 characters. With all the names to include, Dave pointed out we had even less space! One side was stoutly defending that what SMEs thought was important wasn’t necessarily what practitioners needed. The other side (that would be me) wanted to argue that it’s been demonstrated that having an underlying model is important in being able to deal with complex problems. So, of course, the issue really was what we mean by theory. It’s easy (and correct) to bash conceptual knowledge frameworks that don’t have applicability to the problem at hand; Dave revived the great quote: “In theory, there’s no difference between theory and practice. But in practice, there is.” He also cited Van Merrienboer & Kirschner as saying that teaching theory to successful practitioners can be detrimental. (BTW, see Dave’s great series of posts ‘translating‘ their work.) On the other hand, having models has clearly been shown to be valuable in adapting to complexity and ambiguity. What’s a designer to do? So, let me be clear. If there’s a rote procedure to be followed, there’s no need for a theory. In fact, there’s no need for training, since you ought to automate it! Our brains are good at pattern matching, bad at rote repetition, and it seems to me to be sad if not criminal to have people do rote stuff that could be done better by machine; save the interesting and challenging tasks for us! It’s when tasks are complex, ill-structured, and/or ambiguous with lots of decisions, that we need theories. Or, rather, models. Which, I think, is part of the confusion (and I may be to blame! :). I see mental models as dynamic. That is, they’re causal explanations of system behaviour. They are used to explain observed outcomes and to predict the effects of perturbations. It’s the explanation and prediction capabilities that are important. The problem is, if the situation’s complex enough (and most are, whether it’s controlling a production line, or dealing with a customer, or…), you can’t train on all the situations that a learner might face. So then you need to provide guidance. Yes, we’ll use example and practice context to support transfer, but we should refer back to a model that guides our performance. And that’s useful and necessary. So, let me be clear: in any reasonably complex domain (and you shouldn’t be training for simple issues: just give a job aid or automate or…), you should present the learner with a model that you reinforce in examples and practice. It should not be an abstract academic theory, but a practical guide to why things are done this way and what governs the adaptation to circumstances. As that model is acquired through examples and practice, you provide the basis for self-improving performance. That’s my model for designing effective learning. What’s yours? On a side note, what I recall as to the various tweets, and what Twitter shows from each person, doesn’t have a perfect correlation. While I acknowledge my memory failing more frequently (just age, not dementia or Alzheimer’s, I *think*), I’m pretty sure that Twitter dropped some of those messages from the record (the same time they acknowledged having trouble with dropping avatar images). Tweeter beware!